My sister and I brought Mason to catch the last weekend of the New York Botanical Garden Holiday Train Show. The trains weren’t exactly the attraction, The conceit driving this exhibition was that the trains navigated a variety of notable NYC and Westchester County landmarks created predominantly of plant matter. Visitors could marvel at bridges of branches and buildings of bark, an old-fashioned Yankee Stadium rendered in vegetable cellulose, displayed in grand fashion in the Conservatory. Mason was more impressed with the trains. Since the Train Show took up all of about fifteen minutes, we had time to explore the Children’s Adventure Garden. As my little guy explored the attractions, I scanned for birds. The winter array of avians was nothing if not reliable. 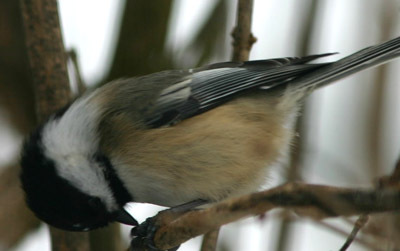 Chickadees, of course, made their charming presence known to anyone paying attention. Both Red-breasted and White-breasted Nuthatches sampled the international line-up of exotic conifers. Crows, pigeons, starlings, blue jays, and overwintering robins were conspicuous, even without optics. But the species in charge of the Garden this time of year has to be White-throated Sparrow. White-throats were scratching away under every bush or stand of grass, edging out Song and House Sparrows and even a lone American Goldfinch. I’m glad they were so plentiful. Most of the birds listed above can be found without much trouble in the Bronx all year round, but the white-throated sparrow is scarce in the warm months. Come winter, though, these birds pour in from the boreal, as reliable as clockwork.